Police say roads across the county have been affected by high winds overnight causing numerous trees and power lines to go down. Lincolnshire Police has said it has received over 80 reports of fallen trees in the county this morning (Thursday) including two causing collisions and advising motorists to avoid driving unless necessary until winds ease and roads can be cleared. Trees are reported to have blown down in the A607 at Fulbeck and Wellingore, across the B1188 at Digby and Dorrington and a toppling tree brought down power lines at Harmston. The A52 at Bicker Bar roundabout has also been blocked by a fallen tree. Western Power Distribution has reported various areas across the south of the county affected by power cuts including around 200 customers in the Sleaford area. That has now reduced to 22 homes. Another 60 homes have been reconnected to power in the Rippingale Fen area. Cropleys coach company has already announced it will not be running school buses to ten schools in the Spalding and Boston area. 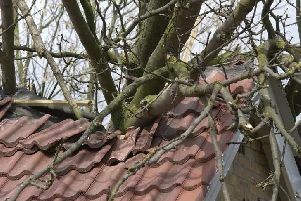 Lincolnshire Police have stated on their social media feeds: “We are experiencing a large volume of calls reporting trees down on the highway and sheds, etc lifting due to the strong winds. Please take extra care and only travel if absolutely necessary.